The TP-Link Archer T6E AC1300 Wireless Dual Band Adapter fits simply into a PCI-E slot in your desktop system. 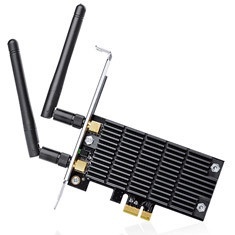 Featuring next generation Wi-Fi speeds and backwards compatibility to all wireless standards, the T6E is able to provide a greater range of connection and stability, as well as speeds 3 times faster than wireless N. An integrated aluminium heat sink allows for greater heat dissipation from high temperatures generated by the adapter - increasing performance and stability of your wireless connection. With a combined total wireless speed of 1300Mbps over the crystal clear 5GHz & 2.4GHz bands, the Archer T6E is the superior choice for seamless HD streaming, online gaming and other bandwidth-intensive tasks.